Nintendo has announced three more games to join its Nintendo Selects collection. Super Mario Maker for Nintendo 3DS, The Legend of Zelda: Majora’s Mask 3D and Star Fox 64 3D join the library on February 4. The three first-party titles join a host of other classic games at a permanently reduced retail price of $19.99 each. 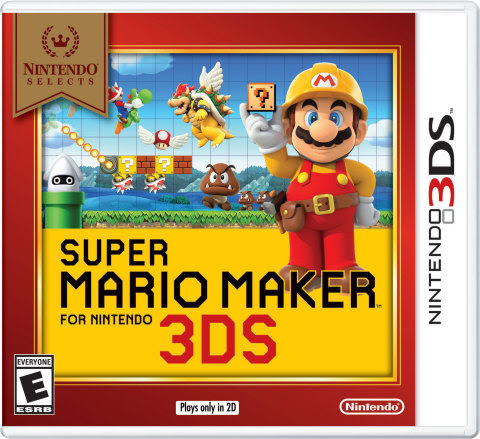 Other games already in the library include Super Mario 3D Land, Animal Crossing: New Leaf, and Kirby: Triple Deluxe. In Super Mario Maker, you can build, play and share your own side-scrolling Super Mario levels using a wide variety of tools. There are all sorts of creative ways to make your levels truly unique – whether you want your cannons to shoot coins, or to let Bowser fly. The handheld’s touch screen takes advantage of intuitive controls to make it easy and fun. Plus, you can take on 100 built-in courses as you tackle the Super Mario Challenge. In The Legend of Zelda: Majora’s Mask 3D, the classic game is given a new lease of life in remastered and enhanced form. From the memorable characters to the dark and mysterious story involving time travel, Link must save the world of Termina from destruction by helping citizens, battling bosses and solving challenging puzzles. In Star Fox 64 3D, join ace pilot Fox McCloud in an action-packed space shooter that puts you in the control of the classic Arwing. Blast, warp and barrel roll across space in missions that take you through the Lylat system, facing off against enemies, collecting power-ups and fighting powerful bosses on the way to the final battle against the evil Dr. Andross. Will you be picking up any of these classic titles at the newly reduced price? Let us know which game is your favorite – or which you’d like to see added to this collection – in the comments section.